ICD-10 Timetable: Where Does Your Organization Stand? 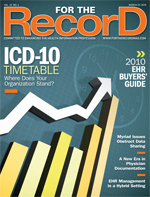 ICD-10 Timetable — Where Do You Stand? Experts agree that planning for the seismic shift in coding operations should be well under way. While October 1, 2013, may seem like another lifetime, the truth is if healthcare organizations haven’t started planning for ICD-10 implementation, then they’re already behind. There is definitely a false sense of timing, says Rhonda Buckholtz, CPC, CPMA, CPC-I, CGSC, CPEDC, COBGC, CENTC, vice president of business and member development for the American Academy of Professional Coders. “The year 2013 may seem like a long time away and [as a result], organizations are making the mistake of not dedicating the time necessary now to properly implement and plan,” she says. The third component on Westervelt’s list is a data assessment, meaning that providers should consider ICD-10’s impact by analyzing current ICD-9 data. She suggests organizations ask questions such as these: What are the concentrations of ICD-9 codes? What are the highest volumes and highest dollar ICD-9 codes? Westervelt adds that those who are under the false impression that vendors are responsible for implementation may be focusing on only one component: the technical implementation. “Akin to Y2K, these organizations are looking at the implementation as solely technical and not looking at the big picture and realizing the impacts are on all areas of the healthcare business, from the patient’s encounter with the provider, through recording the encounter and billing, to the payer receiving and validating the codes and performing all other necessary business functions through payment to final disposition,” she says. Healthcare organizations that find they are behind in planning should make an immediate effort to catch up. According to Zenner, first and foremost, the effort should be on the assessment process. “If a hospital hasn’t done an impact assessment, they need to start there. They can’t know what they need to do or how long it’s going to take until they take that first step,” she says. Don’t panic too much if you’re behind; just plan to get started now. “It’s never too late to start planning,” says Westervelt, who believes the real key to a successful implementation is obtaining C-level support. As a matter of fact, getting that commitment from hospital executives—who need to realize that ICD-10 is a business challenge that requires support from across the organization—should be one of the first steps, she adds.